The mat shown underneath my supplies is a self-healing Xacto cutting mat, but it’s not necessary for this project. It’s just my little home base for all DIY craftiness. The sticks are too long as-is, so you need to cut them in half to make them the right length. I use a pair of wire cutters to get the job done. It works great! 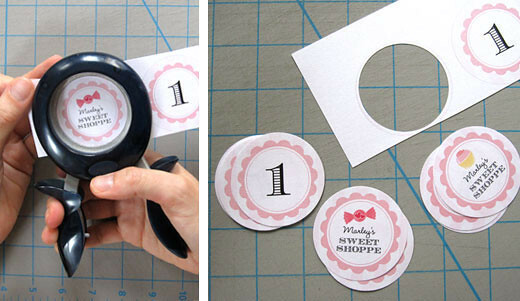 Cut just underneath each row of circles to create horizontal strips of paper. To me, this is the most fun part! Align each design within the viewing area of the craft punch, and punch away! Put a printable circle face down, so that the blank side is facing you. 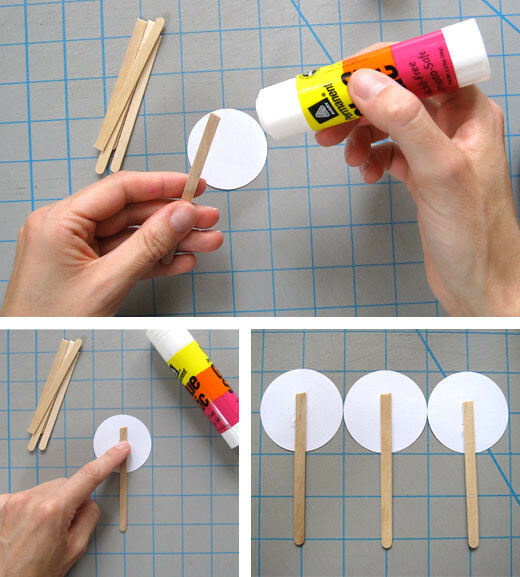 Use your glue stick to put a little glue on the top half-inch or so of the popsicle stick (make sure you glue the side that’s been cut – that way, the cute rounded end will be the one left showing). Press the glued area of the stick firmly against the back of the printable circle. 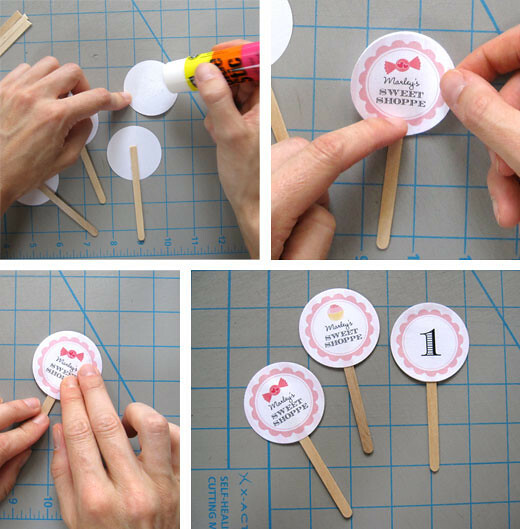 DIY cupcake topper sets of all sorts – with matching cupcake wraps! – are available at www.chickabug.com. I total "scraplift" sticks from Starbucks too...Maybe we should check at COSTCO? Your Blog is beautifully done. I have visited everyday since I discovered it. THank you. kitchen/office supply stores! Nothing like them anywhere! Super cute! And I love that circle cutter. I'm gonna have to find one of those!! Thanks for sharing. 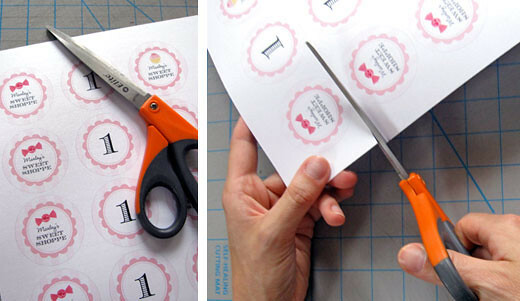 Great idea- couldn't you simply print the circle sheet on sticker paper and then not have to use glue- little more expesive for sure but super easy! This is an adorable idea for customizing themed cupcakes! Just love the DIY! Many thanks from Cookie Wishes! What about using the sticks they use for waxing your brows? They look very similar to the Starbucks ones. Amazing! I actually just bought the round and round puncher just for this! You mean you've lived without one until now?! ; ) I'm so glad the tutorial helped! And you'll never regret buying that puncher, believe me! What program do you use to design the printables? Thanks for this tutorial. I was wondering which size to use as I really need to get this to start making them. Thanks for the quick tutorial. 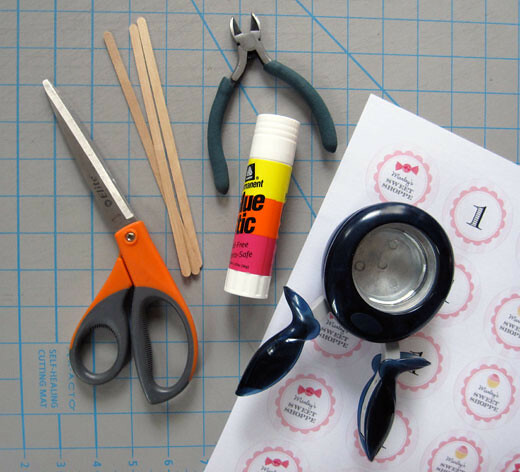 Since I've never done paper crafts I've never heard of the circle punch you used. I think I'll cut squares with sissors, since I don't have time (or money) to run to Joann's before I get these done. I need to figure out a way to get 50 sticks (need 100 toppers) from Starbucks. For a huge quantity I'd recommend asking a Barista if it's ok to take them - I personally collect 2 extra sticks each time I buy a coffee and it adds up, but if you need them all at once, it might be good to ask. That way you don't get 'caught' making off with a giant handful of sticks. ; ) I'm sure they'd be cool with it! 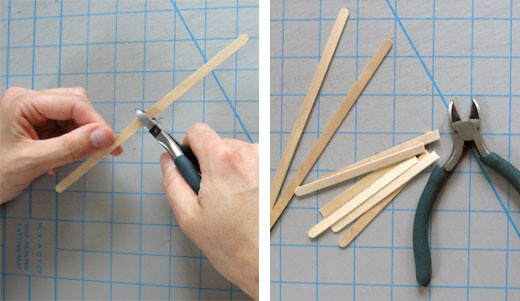 Or you can buy popsicle sticks at a craft store, many people use popsicle sticks instead of small wooden sticks. Love this idea - you are very talented. What is the diameter of your cupcake topper? So, what is the final length of those Statbucks sticks, once you've trimmed them down? I found wooden coffee stir sticks on Amazon that I'd like to try. I didn't even know a circle paper cutter existed until I read this! This will be a huge money saver for DIY birthday cupcake decorations. I'll be linking over to this when I write my DIY birthday party decoration post! This one is very nice. How to get the printables..